Perhaps it was because I’d just told my six-year-old son that he looked a bit like Abi when he gave me a cheeky grin. It wasn’t to make him feel sad, it just slipped out. Is it bad to say things like that? I don’t know. Last night, my son was getting ready for bed and was in his bedroom. He’d been quiet for a while and came into my room where I was feeding my baby son on my bed. He looked sad and simply held up a keyring. It was of Abi. Taken on the chair lift at The Needles Park in Isle of Wight. Our last proper family holiday before she died. We’d all gone down to the beach on the chair lift. The ride was wobbly to say the least and I pretty much clung to my other daughter, who was nine at the time. My husband went down with my son. Abi was fearless of course and went down on her own, her arms outstretched and a big grin as the camera took her photo at the top of the climb back up. 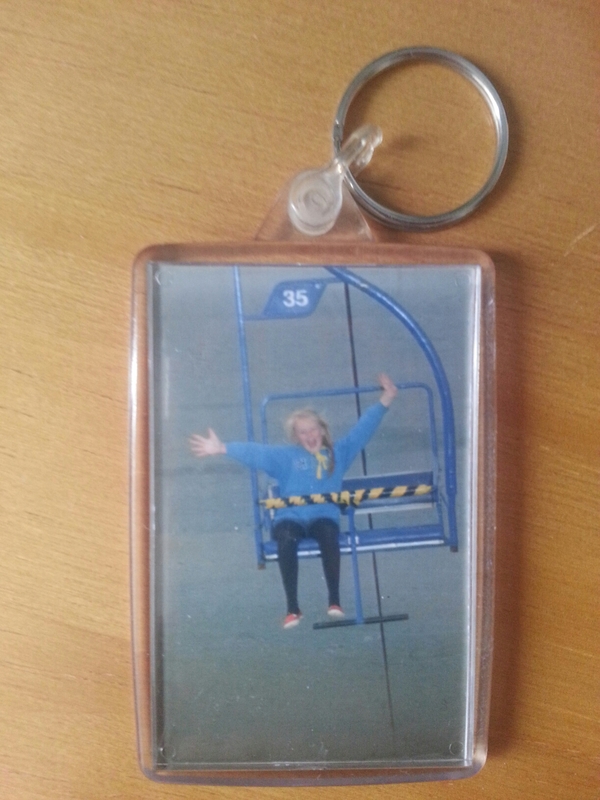 We had our photos turned into keyrings; a little gimmick but a valuable keepsake now of course. He also had a small rubber from PGL, from her school residential trip in Year 6, she bought it for him with her pocket money. He keeps little memories of Abi in a tin box in his room. He must have put them there a while ago, as he tends to squirrel his things away, and then found them while he was playing. He said, ‘I’m sad’ and began to cry. Gentle tears not loud sobs. He cuddled into me. ‘I miss her too darling, we always will,’ I said as gently as I could, not wanting to say too much. I reassured him it was OK to be sad and we talked of how our memories will help us remember Abi. I was cracking up inside, I wanted to wail, but I wanted to make the most of this rare moment with him, to get an idea of how he was feeling. He then found an old disco ticket that Abi had made not too long before she died. She had held a disco in her bedroom one night, charged us entry (she wasn’t stupid!) and we all had a dancing competition to Gagnam Style – my son won. He likes that memory. I suggested that, to remember Abi, we have a new bedroom disco in his room. He seemed to calm down and began to get busy amending the original ticket to a new disco. I felt a pang as he wrote all over Abi’s writing, but then I have plenty of copies of her writing of my own. This was his and his way of doing things. Whoever says young children have limited understanding or get over things easily is wrong. My son is so honest and open about his feelings. He knows what being dead means. Even though he didn’t speak while we were on the bed, preferring to act mute and point at the things he had, when my husband came into the room he said quite frankly, ‘Me and mum just had a cry… about Abi.’ My heart swelled. He went off to bed, happy enough, like it had never happened, but it’s one of those moments that will stay with me forever. This entry was posted in Life with grief, Living and grieving, Remembering Abigail and tagged bereavement, family, grief, life, loss of a child, siblings by Chasing Dragonflies. Bookmark the permalink. I totally agree with you, very young people seem to understand death and the emotions surrounding it far better than older people. I can talk about my brother to my children in a way I never could to anyone else and they treasure the mementoes I have of him just as much as I do. Thank you, that’s so good to know. We could all do with acting like our children sometimes!